Molto Bene! 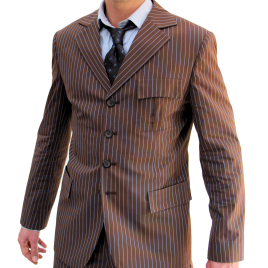 - I ordered both the brown and blue suit, and they are both truly wonderful. I've kicked everything else out of my wardrobe as these now take the prime position as my everyday wear. Owning a swatch of the original GAP fabric from Tennant's suit, I can say with the highest of confidence that Magnoli has hit the nail bang on the head with the fabric, and the cut and fit of the suit is also perfect. I've been watching the 10th Doctor since 2006. And have dreamed of the day I could own one of his suits. And now I do. If you're considering buying this. Do it. Just do it! You certainly won't regret it.